Human parasites include various protozoa and worms which may infect humans, causing parasitic diseases. Human parasites are divided into endoparasites, which cause infection inside the body, and ectoparasites, which cause infection superficially within the skin. 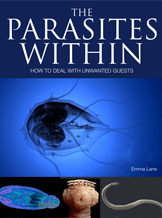 The cysts and eggs of endoparasites may be found in feces which aids in the detection of the parasite in the human host while also providing a means for the parasitic species to exit the current host and enter other hosts. Although there are number of ways in which humans can contract parasitic infections, observing basic hygiene and cleanliness tips can reduce its probability. The first written records of parasites date from 3000 to 400BC in Egyptian papyrus records. They identify parasites such as roundworms, Guinea worms, threadworms, and some tapeworms of unknown varieties. In ancient Greece, Hippocrates and Aristotle documented several parasites in his collection of works Corpus Hippocraticus. In this book, they documented the presence of worms and other parasites inside of fish, domesticated animals, and humans. The bladder worm is well documented in its presence in pigs along with the larval stages of a tapeworm (Taenia Solium). These tapeworms were mentioned in a play by Aristophanes as ï¿½hailstonesï¿½ with Aristotle in the section about pig diseases in his book History of Animals. The cysts of the Echinococcus granulosus tapeworm were also well known in ancient cultures mainly because of their presence in slaughtered and sacrificed animals . The major parasitic disease which has been documented in early records is dracunculiasis. This disease is caused by the Guinea worm and is characterized by the female worm emerging from the leg. This symptom is so specific to the disease that it is mentioned in many texts and plays which predate 1000AD . In Greece, Hippocrates and Aristotle created considerable medical documentation about parasites in the Corpus Hippocraticus. In this work, they documented the presence of parasitic worms in many animals ranging from fish to domesticated animals and humans. Among the most extensively documented was the Bladder Worm (Taenia solium). This condition was called ï¿½measly porkï¿½ when present in pigs and was characterized by the presence of the larval stages of the Bladder Worm in muscle tissue. This disease was also mentioned by the playwright Aristophanes when he referred to ï¿½hailstonesï¿½ in one of his plays. This naming convention is also reflected by Aristotle when he refers to ï¿½bladders that are like hailstones.ï¿½ Another worm which was commonly written about in ancient Greek texts was the tapeworm Echinococccus granulosus. This worm was distinguished by the presence of ï¿½massive cystsï¿½ in the liver of animals. This condition was documented so well mainly because of its presence in slaughtered and sacrificed animals. It was documented by several different cultures of the time other than the Greeks including the Arabs, Romans, and Babylonians . Not many parasitic diseases were identified in ancient Greek and Roman texts mainly because the symptoms for parasitic diseases are shared with many other illnesses such as the flu, the common cold, and dysentery. However, several diseases such as Dracunculiasis (Guinea worm disease), Hookworm, Elephantiasis, Schistosomiasis, Malaria, and Amebiasis cause unique and specific symptoms and are well documented because of this. The most documented by far was Guinea worm disease mainly because the grown female worm emerges from the skin which causes considerable irritation and which cannot really be ignored. This particular disease is widely accepted to also be the ï¿½fiery serpentsï¿½ written about in the Old Testament of the Bible. This disease was mentioned by Hippocrates in Greece along with Pliny the Elder, Galen, Aetius of Amida, and Paulus Aegineta of Alexandria in Rome. Strangely, this disease was never present in Greece even though it was documented .